Strawberry Fields is a special place in Central Park. This memorial is dedicated to John Lennon, who co-founded the Beatles. Imagine, a memorial dedicated to the co-founder of the Beatles. Whatever your age, you know by heart some songs of John Lennon in your mind. The composer of Imagine, Strawberry Fields Forever, Twiss and Shout or Do not Let Me Down was assassinated on December 8, 1980 in front of the Dakota Building, his home in New York City. A few steps away from the building, New York City pays tribute to the British musician in a small and shady spot, Strawberry Fields. 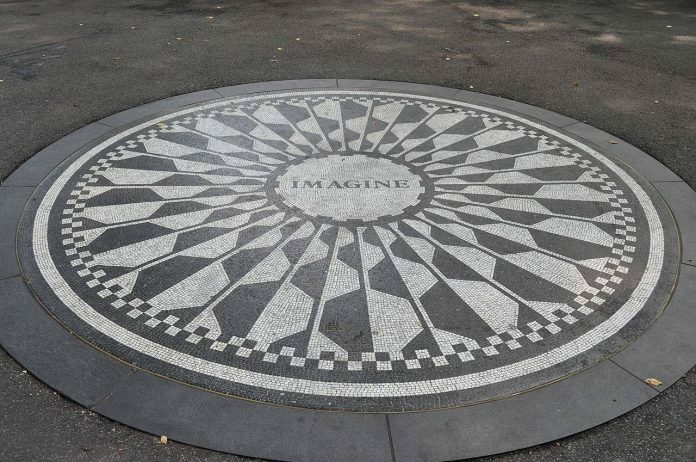 The memorial is very simple: it’s just a mosaic with the word “Imagine” written in its center. The memorial was inaugurated on October 9, 1985 for what would have been the 45th anniversary of the artist. the memorial is not really impressive but I really advise you to make a stop there during your visit to Central Park. Strawberry Fields is a very lively place with singers scratching their guitars. You will also often see flowers and candles deposited by fans. Nearly 40 years after his death, fans have not forgotten John Lennon! Next articleWhere is the shortest street in New York City ?